The Byron Bay property market is becoming just as sought after as those magnificent beaches that hug the area’s dreamy coastline. Byron Bay is an idyllic place to sink the holiday toes into, but an even better place to unpack the suitcase for more than a week, swap the city train ride for breezy bicycle rides into town and call places like Beach Byron Bay your local. 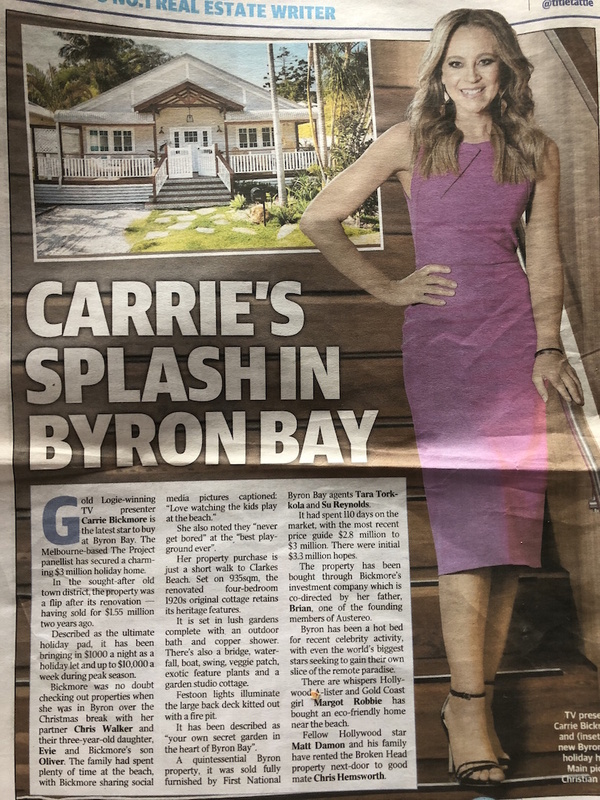 Well known TV presenter Carrie Bickmore is the latest star to pick up her piece of celebrity property action in town. Featured recently in the Daily Telegraph is our Byron Bay roofing project for SpaceBuild, who completed the renovation for the Melbourne based panellist. Described as ‘ a quintessential Byron Bay property’, and built in the 1920s, the four bedroom original cottage is just a short walk to Clarkes Beach. The ‘bull nose’ roof featured on the verandah of the property pays homage to the heritage era. We seem to be swimming with Byron Bay metal roofing projects of late, and look forward to showcasing our latest project for MRB Constructions located at Suffolk Park next month.